← Tom Cruise’s Edge of Tomorrow is mighty fun! A bus conductor gets into a fisticuff with an uncouth passenger, loses his job and is tempted to pursue a career as a black marketeer of cinema tickets. How he yields to the dark side is most compelling. “Badi kadki hai. Kutte ki maut maroge agar Bambai mein paisa nahi hai toh, samjhe?” cautions a typically harsh-but-true voice around him. Disheartened, he walks back to his dilapidated house and greets his gravely ill mother (Leela Chitnis) flanked by her two younger children (Nanda, Sushil Kumar). Nobody to share his troubles with, the intense contemplation in his dejected eyes convey every single cry in his head even as the haunting slogan of Paisa Babu Paisa plays out against hectic sights of Mother India’s posters and salesmen baiting off cheap bargain. Desperate yet determined, he robs an affluent lawyer (Chetan Anand) and accumulates his team of fellow black marketeers who’re as needy, spurned and down on luck as him. From calling out “utro, utro” in the bus to chanting, “savaa ka do, savaa ka do” outside movie theatres, the turn of events is significantly dramatic. The first ten minutes of Navketan Films’ Kala Bazar reveal a lot about the doddering post-independence socio-economic climate and how it impacts the disillusioned common man and its reluctant hero. Written, directed and co-starring Vijay aka Goldie Anand along with elder brothers Dev and Chetan, the 1960 black and white drama is yet another fine example of his timeless filmmaking. If there’s one director who could play with the traditional Hindi film narrative as nimbly — enriching it with wholesome details, technical wizardry and defined emotionality — it’s Goldie. Kala Bazar inspires awe on many levels. What lends it socialist theme greater subtext is how he makes a convincing case of a man (Dev Anand) who takes up an illegal route to success and then renounces it on realising dishonest money can’t buy him dignity of labour, a peaceful conscience or respect from his near and dear ones. While it may sound too righteous or preachy — not such fancy expressions in today’s scheme of sentiments — Kala Bazar’s belief in reform and refusal to embrace corruption is most refreshing, especially in today’s scheme of decayed morality. Even if he’s a tad too stylish for a man running a black marketing business, Dev Anand’s Raghuvir exudes an air of leadership most crucial to this story. As is what, rather who, brings about this change of heart, namely, Waheeda Rehman. 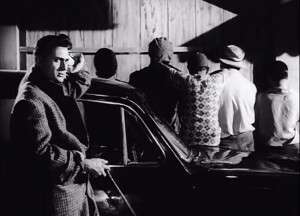 Their initial encounters, even if indirect, are quite intriguing as he discreetly eavesdrops on Rehman’s delightful chemistry, based on sweet banter and mutual fondness, with Vijay Anand. Rehman’s Alka is a portrait of scruples with an uncompromising sense of right and wrong. Her classmate and fiancé, Nandkishore (an endearing Vijay Anand) is a liberal nerd doting on her but doesn’t share her rigid attitude. Their conversations — the argument outside Marine Lines’ Metro cinema or a heart-to-heart about the future of their relationship after he goes abroad for further education – leave a powerful impression on Raghuvir. Suave on the surface, he realises his lack of education lends him no real standing. When Raghuvir bumps into a knowledgeable gentleman, he seizes the opportunity and devours book after book offering intellectual insight and progressive thinking. 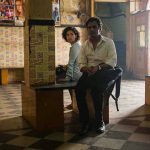 How it truly revolutionises him is underscored in the final few scenes of Kala Bazar. On both occasions, the mastery of Vijay Anand lies in creating clever plot motifs and unveiling their beauty at perfectly timed junctures. Even through its pensive disposition, Kala Bazar is not a dark film by any standards. 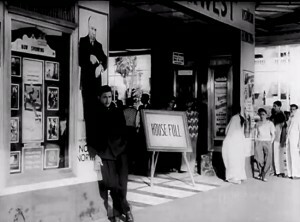 Its vivacity bubbles in Vijay Anand’s portrayal of Mumbai’s love for cinema and its once throbbing single screens’ culture of selling sought after tickets in black. There’s nothing exaggerated about the moment when the wealthiest beseech Raghuvir for tickets of the Mother India premiere like school boys gathered outside Liberty theatre at its glorious best. When one fellow snidely remarks, “Koi gaana chala nahi,” he’s immediately censured with an “Abbe picture chalne de, daudenge, daudenge,” by another. But the coolest bit is when the celebrities emerge out of their swanky cars to walk down the red carpet amidst deafening sounds of cheers and claps– Dilip Kumar, Guru Dutt, Rajendra Kumar, Lata Mangeshkar, Nadira, Kishore Kumar, Mohammad Rafi, Sohrab Modi, Baby Naaz, Mehboob Khan, Raaj Kumar and, of course, Nargis. In his autobiography, Romancing With Life, Dev Anand writes how his ingenious brother perched himself on a “high platform” behind a zoom lens to shoot this star-studded event. Manmohan Desai’s Naseeb, Ashutosh Gowarikar’s Pehla Nasha and Farah Khan’s Om Shanti Om adopted a similar approach in later years to choreograph their individual tributes. 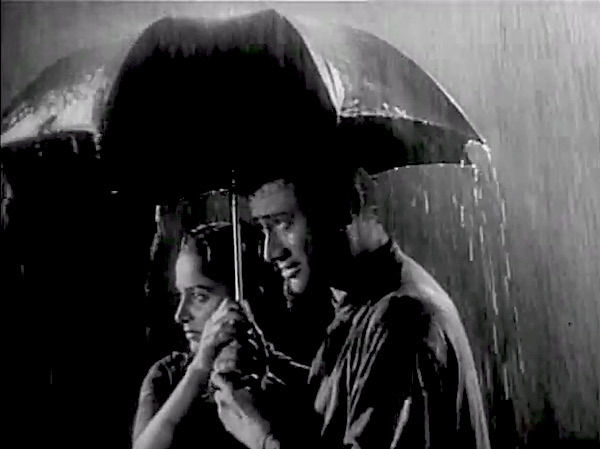 Another cheery facet of Kala Bazar is the breezy romance between Raghuvir and Alka in Ooty. It’s also one of the film’s most weakly set links. There’s a sense of hastiness to their friendship even if its not met with instant approval from Alka. Like the appearance of the flirtatious S D Burman melody, Saanjh Dhali Dil Ki Lagi follows too soon after the exquisite train ditty Apni Toh Har Aah Ek Toofan Hai. 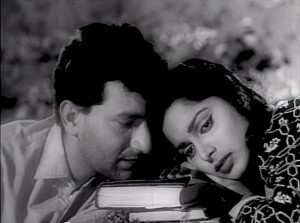 Having said that, lyricist Shailendra and SD weave sheer magic through the compositions, which is most fruitfully realised in Mohammad Rafi’s flawless rendition of Khoya Khoya Chand. As is the loveliness of Asha Bhosle and Geeta Dutt’s distinct flavours in Sach Hue Sapne Tere and Rimjhim Ke Tarane Leke Barsaat respectively. Even if the Ooty episode slackens the pace a little, this is Dev Anand and Waheeda Rehman after all. The evergreen hero drips with charm and the Chaudhvin Ka Chand lady’s presence lights up every frame with that inexplicable something no one before, no one after can boast of. Rehman is a sprightly young figure, a welcome relief from the self-sacrificing, docile, touch-me-not prototypes. Like she tells off Nandkishore in one scene, “Main Sati Savitri nahi hoon jo chup chap sehti rahoon aur maaf karti rahoon.” And when Raghuvir finds himself dangling from a mountain’s edge, she wastes no time in taking off her sari to pull him right up. What’s even more remarkable is the filmmaker makes no fuss about her daring deed (for that time). Note how rationally Vijay Anand handles the scenes between his Nandkishore and Alka in the second half following his return. Again, no needless melodrama, no sullen close-ups and no lingering background score to imply whatsoever. Kala Bazar’s visual finesse is an added bonus. Every scene, under V Ratra’s meticulous lighting and creative angles, brings out a dual view. Every single shot is a beauty but the one of Dev Anand resting against a poster of Alfred Hitchcock’s North by Northwest and the leading pair taking refuge under a single umbrella during Mumbai’s classic downpour lingers on. Speaking of posters, Vijay Anand punctuates many a scenes with their symbolism — be a conscience-challenged, freshly fired Dev Saab with a poster of Do Aankhen Baarah Haath gazing through his back, him outwitting the cunning Madan Puri with a huge Dilli Ka Thug board looming behind or selling lyrics booklets in the same spot he once sold tickets in black against a freshly pasted poster of Talaq. 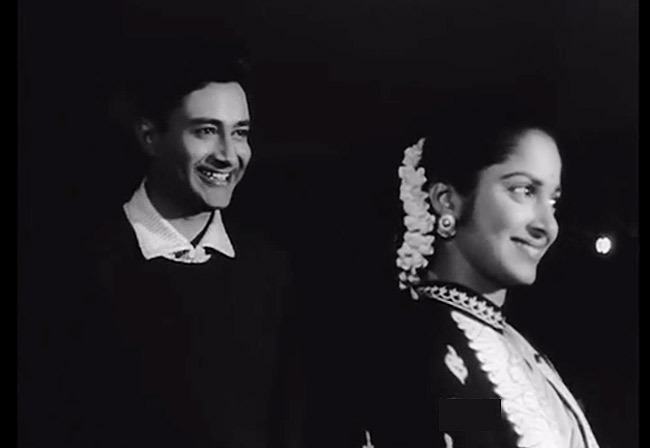 The prospect of making a clean living to stand tall in Waheeda Rehman’s eyes makes a good man out of Dev Anand. 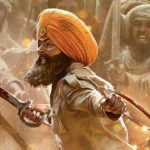 But the path of salvation is tougher than it seems even after The shifts his fortune and his company through ethical means to, what else, Safed Bazar. And some eloquent disputes in the climatic courtroom scene boosted by Chetan Anand’s persuasive monologues highlight the need to acknowledge and respect a man’s willingness to become better and inspire the same. 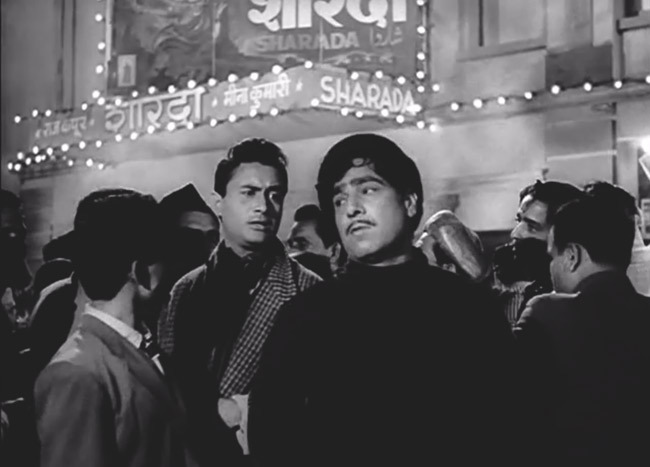 Like his colleague Raj Kapoor in Awara, there’s no leeway in the matters of law but as Dev Anand’s no longer reluctant hero points out what’s truly important is the awakening of one’s conscience. While the socialist dream still lives on, Vijay Anand’s idealistic Kala Bazar is certainly a creation everyone associated with can feel proud of. This entry was posted in Classics, Columns & Reviews. Bookmark the permalink.